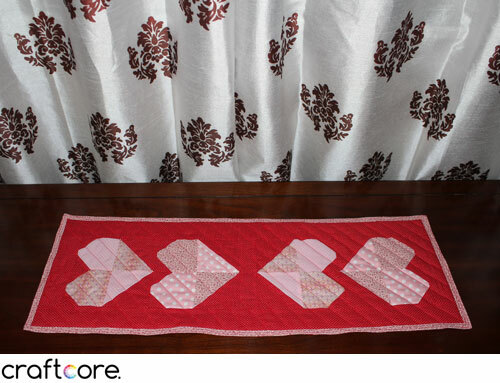 This table runner is a great gift for a loved one for Valentine’s Day – or even yourself – for some festive February decor. 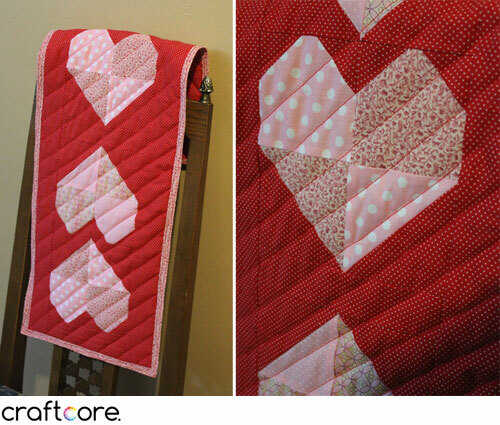 I participated in a Valentine’s Day swap on an online quilt group and designed this pattern from scratch. 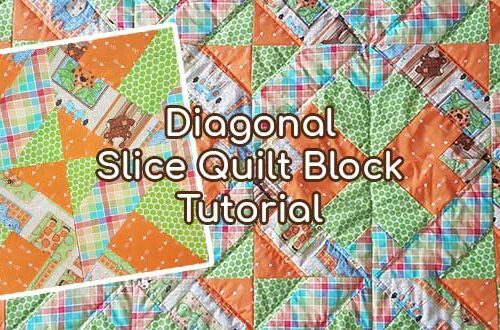 This tutorial combines two basic techniques: the half square triangle and quick corners. Let’s get started! 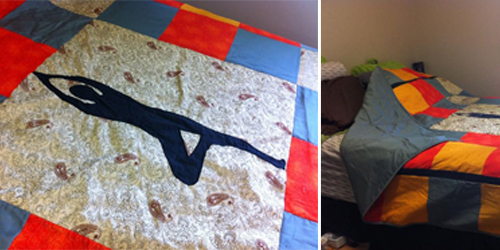 You’ll need five fabrics for the design. 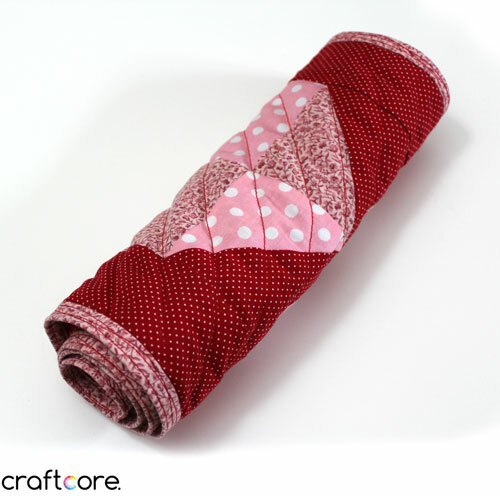 One red background fabric and four pink focal fabrics. The finished table runner will be 11″ x 317/8″. I’ll use my favourite half square triangle technique for this section of the block. Check out my guide for pictures of these steps, otherwise simply follow along below. 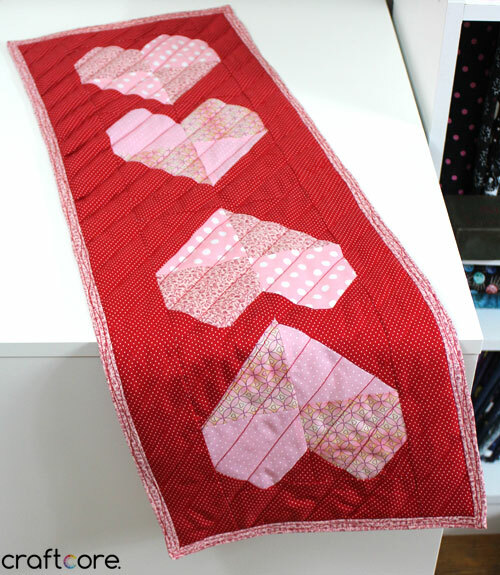 Take one of your red 45/8″ squares and place it right side up on a flat surface. 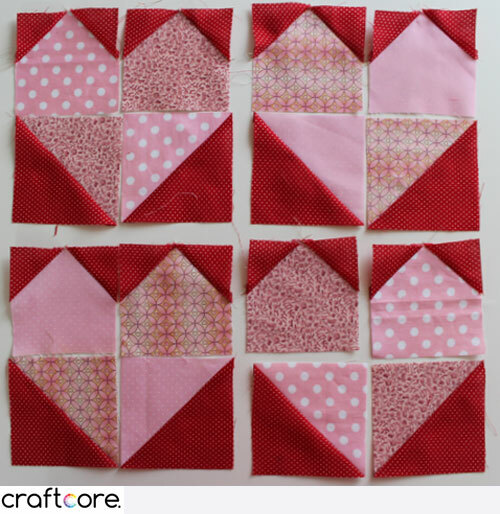 Take one of your pink 45/8″ squares and place it on top, right side down. Hold a ruler from one corner to the corner diagonal from it and mark this line in disappearing fabric marker or a pencil. Sew a 1/4″ seam down either side. 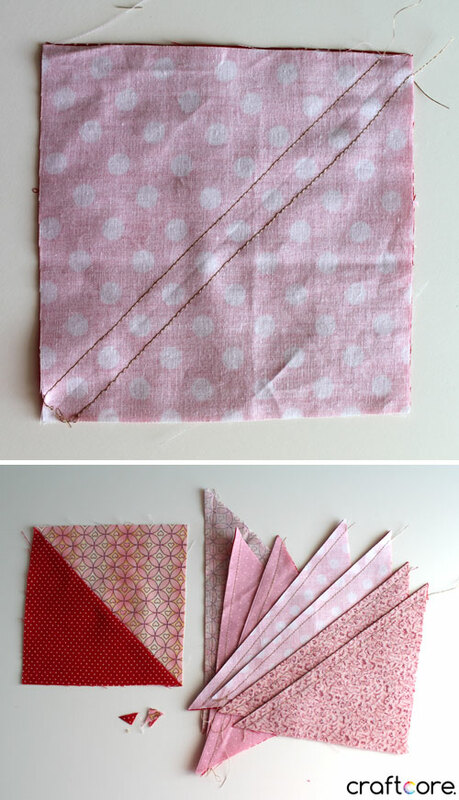 Repeat for your remaining three pink fabrics; you can chain piece these if you’d like. Cut along the marked line, then press all your half square triangle units open with the seam towards the darker fabric. Snip off the little dog ears. 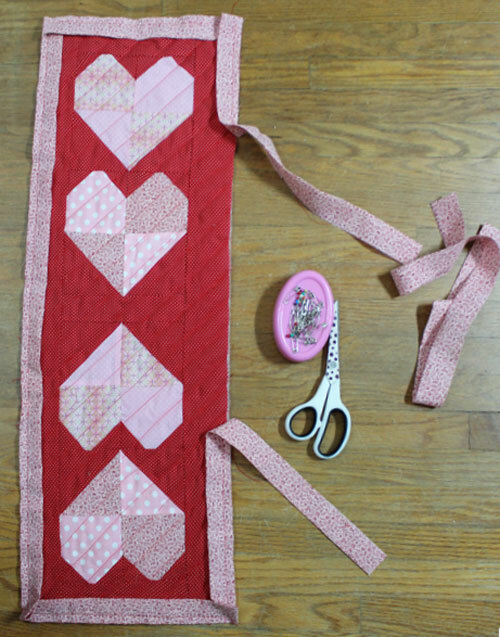 We’ll use a quick corner technique for the tops of the hearts. 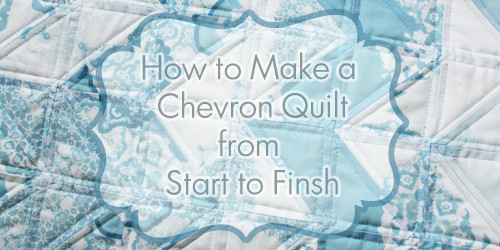 This may also be called the “snowball” technique because it’s a technique used to create a very common quilt block, the snowball. We are essentially making half of a snowball block for our top half of our hearts. Arrange your hearts in a pleasing layout to your taste. I chose to set up alternate prints in adjacent positions. 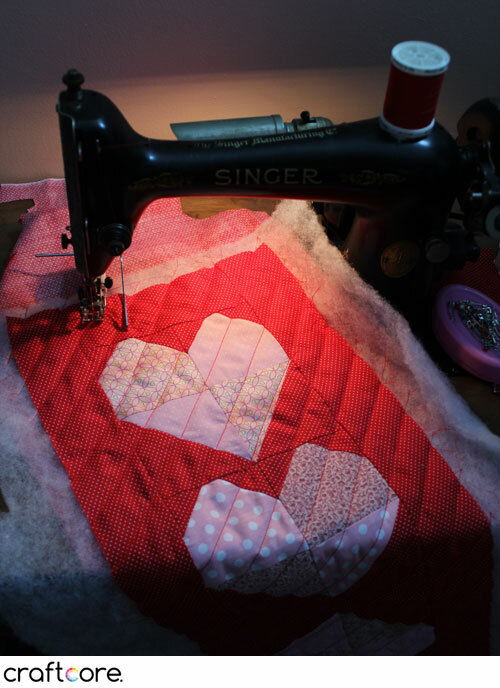 Start by chain piecing pairs of bottom hearts with the corresponding top of the hearts, right sides together. Snip these apart and press. 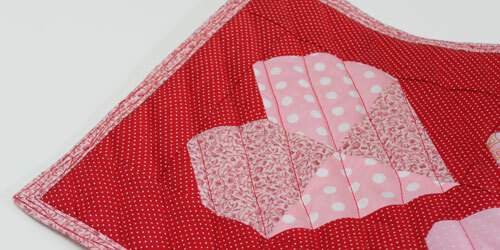 Now sew those heart halves together, right sides together. Press. You now have four heart blocks! The hard part is behind you – time to join all the pieces together. 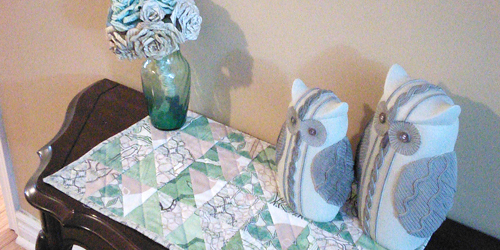 Sew the two remaining long border strips to the outside of your table runner top. Press the seams. Your table runner is nearly complete; all that’s left is to sandwich your backing, batting, and table runner top. 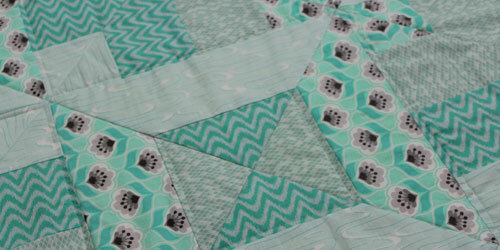 Quilt it however you would like (I chose to do a simple diagonal all-over design). Sew on the binding and you’re done! Here are some shots of my completed project. I made a ton of mistakes while sewing – that’s what you get for sewing when you suffering from major headaches, but I had to get this project out the door and to the post office so that it would make it on time to its recipient. The ol’ noggin doesn’t always cooperate under stressful conditions. You may notice that my binding looks a little wild. I normally machine bind my quilts, so I’m supposed to sew the binding to the backside of the quilt, then flip it over and machine sew it down to the front of the quilt. In my headache-induced haze, I sewed it to the front side by accident. I decided to move forward due to my deadline, but my stitching wasn’t as great as I would like for the front side of the quilt. I decided to do some decorative stitching on top of my binding to give it a more intentional look. In red thread, I sewed a line of stitching approximately 1/8″ from the outer edge of the binding, then another line of stitching 1/8″ from the inner edge of the binding. Then, I sewed a wavy line of stitching between the inner and outer edge of the binding. In the end, I was happy with how the binding turned out, but may this be a lesson to me to not procrastinate so much!